Discontinued – All pur-Absorb™ Iron products have, unfortunately, been discontinued in the United States. If you have any questions please contact us at 1-800-319-9151 (choose option 2) or CustomerServiceUSA@nelsons.net. I have always had lower iron levels in my blood. I try to eat well, but as a woman especially, monthly menstruation can really lower my iron levels. After hemorrhaging with my first birth, my midwives put me on Floradix Iron + Herbs Liquid Extract Formula and Organic Black Cherry Juice[ to rebuild my blood. My son also suffers from low iron, so I try to keep Floradix in stock at home. Floradix is rather expensive, and we forget to take it. It must be kept in the refrigerator after opening, and thus, we forget about it. We end up usually tossing out at least half the bottle by the time it expires. I have recently discovered the 100% Natural Liquid Iron Supplement pur-Absorb sent to us by Naturally Savvy. When consuming a lower dose of iron like pur-Absorb, side effects often associated with conventional iron supplements such as constipation, stomach irritation or headaches become far less likely. Each highly absorbable packet of purAbsorb will fulfill the body’s daily absorbed iron needs without having to excrete too much iron – often the cause of the unpleasant side-effects experienced with iron supplementation. pur-Absorb Iron is a naturally occurring iron-rich spring water which is collected and packed straight from the source in the heart of Snowdonia, North Wales, United Kingdom. We collect it, we filter it for bacteria and we fill it into our convenient, easy-to-open packets. At no stage do we add anything to the water or convert the water’s natural composition. That means with pur-Absorb, you don’t have to worry about other ingredients causing adverse reactions or complications. 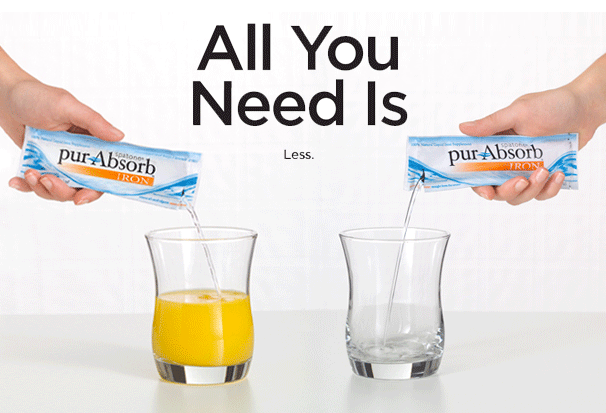 I like that Pur-Absorb comes in individual packets and does not expire for a year. I don’t like that Pur-Absorb comes in individual packets, as it is a lot of packaging. It is very important to keep any iron supplements out of reach of children. I am not sure if this product is safe for my son to use. Pur-Absorb is a great option if you suffer from lower iron levels, as I do. I am not sure if my vegetarian diet contributes to this iron deficiency, and I really don’t like to take supplements. In general, I combat my low iron levels naturally by eating lots of dark leafy greens and cooking in cast iron pans. Pur-Absorb is a great option for when I am feeling the effects of low iron, such as fatigue. I am not sure. You can contact customer service. I included the number in an update to the post.